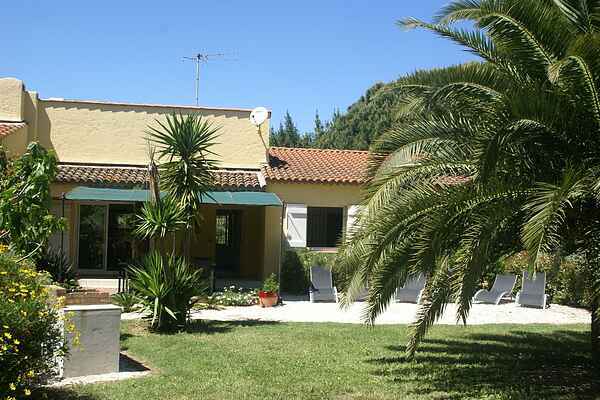 We are proud to present this holiday spot just 400 m from the legendary, 5 km long, white sandy beach of Saint-Tropez. The holiday home lies hidden away between southern French bamboos and pines. At the villa you will find a beautiful terrace with garden furniture, sun loungers and a big level garden with many shady places. You share the driveway of the large grounds with the people who are renting the other semi-detached house, but both have a private garden and there is no visual contact on the terrace and in the garden. From here you can easily walk to the famous beach with the well-known beach club \"Club 55\" where VIP's come to have lunch in the summer time. The rich and famous arrive here on their luxurious yachts from Saint-Tropez or with their private helicopter. In the evening you can go to the village for the parade of Ferraris, Maseratis, beautiful people and of course the giant yachts. In the afternoon you can visit the small but very fine museum 'L'Annonciade' where you can admire works by the painters Paul Signac (famous for painting with dots, 'pointillism') and Matisse.